After building several villas for Tito, party leaders and the generals of the Yugoslav People's Army private companies courageously began to build for themselves or their directors. 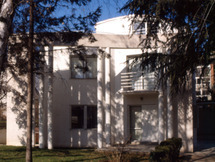 In this case in an elite residential area of Belgrade - Dedinje was built two-family houses. At the same time,..